The recipe was handed down to my mother, and adapted at each stop, from a man named Fran, whose daughter was my first babyhood friend. I don't really remember Fran — he passed away when we were still tiny — but he lives within me every time I make this soup. Now I see fit to serve it to anyone I love — from my own little person (who also slurps, dribbles, and hums) to a cozy winter dinner party, where guests often let go of their manners too. We always called it Italian escarole soup because Fran used escarole — a broad-leafed, less bitter form of endive — as the green element, although you can use kale, spinach, chard, collards, even broccoli greens. It's also known as zuppa di scarola or minestra marinata (Italian wedding soup) because of the way the ingredients combine, like a happy love. It is simple to prepare, but has enough flourishes — herby meatballs and a last-minute addition of cheesy egg ribbons — to make it special enough for guests. 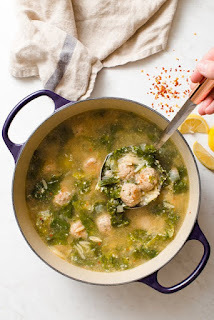 Italian wedding soup has long been one of my favorite soups, but it's one I've never made myself, as I always assumed it was a chore to make all those meatballs before making the soup itself. This recipe proved I've been wrong for years. The soup actually comes together quite easily — I made it on a weeknight for a casual dinner party without fuss. Stirring in the egg mixture in one direction helps to prevent any serious curdling, which was a concern of previous commenters. Also, while the original recipe doesn't call for adding any pasta to the pot, I've always felt that it's not Italian wedding soup without it. Whichever route you choose, though, you won't be disappointed.